Families and individuals wanting to learn how to cook healthy food are invited to a new project on Bury Market. The Better Health at Bury Market campaign is being launched on Wednesday 12 March, and each month will have a different theme. The aim is to help residents make small changes to become healthier and improve their cookery skills by showing them how to make healthy meals cheaply using good quality fresh produce bought from the market. 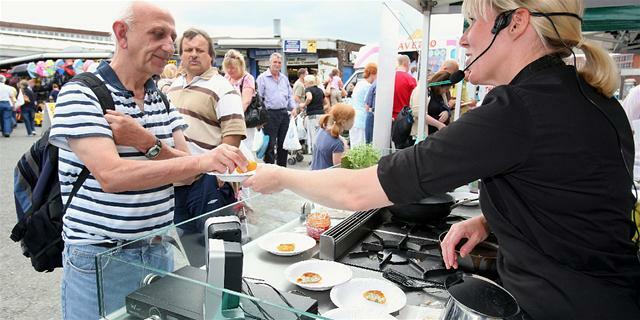 Visitors can sample the various dishes on offer and pick up recipes, and get tips from public health professionals. All produce used in the recipes is being kindly donated by Bury Market traders. V for Victory is the first theme on 12 March. Delicious @ the Fusiliers will be cooking up wartime recipes that you can sample and there will be a display from the Fusiliers to mark the 100th anniversary of the start of the First World War. The Stop Smoking Service will also be present to support national No Smoking Day, with advice on how quitting smoking will be good for your health and your wealth. Bury Market will also host an Owl and Birds of Prey Roadshow on Friday 14 March from 10am onwards.